Traditional dentures have been around for a long time, and have been the standard remedy for tooth loss since the days of George Washington. There have been many improvements in dentures in recent decades, better materials and better fit, for example. But the most significant advance in restoring lost teeth, by far, has been the advent of implant dentistry. Dental implants can now give you a set of prosthetic teeth that feel and act more like natural teeth. Today’s patients now have a choice between traditional and implant-supported dentures, and the differences between these two treatments are immense. Patients who wear dentures usually need a period of a month or more to get used to their prosthetic teeth, because they don’t function the same as natural teeth. One must relearn how to chew and speak, essentially. With dental implants, however, the dentures are securely attached to the jaw, just like natural teeth, so there is no discomfort or awkwardness involved. They are also more comfortable overall, because they don’t rub against the gums when you eat. Since dentures only stay in place via the power of suction and adhesives, they tend to slip loose occasionally. Implant-supported dentures are different because they are designed with a snapping mechanism that holds them in place. They will not slip loose when you are eating, yet can easily be removed manually for cleaning and soaking. In some cases, they can also be attached permanently for patients who may not be able to take care of themselves and would be more likely to lose or damage them. The problem with traditional dentures is that they don’t maintain an ideal fit, since jawbone resorption is an on-going process. Less than perfect fit can leave you with dentures that slip and cause friction to the gums. This can make eating a painful proposition. 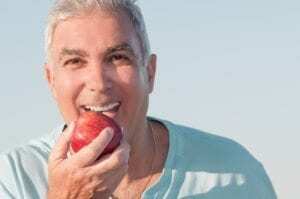 Since nutritional requirements change as we age, it’s important for denture wearers to be able to eat a rich variety of fresh fruits and vegetables. Dental implants enable you to keep eating all the same foods you could eat with your natural teeth. Corn on the cob, crisp apples, and steak will be back on the menu and you’ll never have to fear the irritation of dentures again. The signs of aging can take a toll on anyone’s confidence. Add unstable dentures to the mix, and you might not feel like dining with friends and family ever again. Dental implants can restore your confidence in your appearance. Not only will they stay put while you are eating and speaking, but they also preserve your facial structure over time. Traditional dentures do nothing to prevent facial diminishment, a distinctive sign of aging in patients who’ve suffered tooth loss. Without tooth roots, bone mass in the jaw slowly gets re-absorbed by the body. Dental implants mimic natural toot roots and signal the body to keep supporting the jaw bone. This means that dental implants are the only prosthetic option that actively prevents the appearance of a shrinking face and chin. Implant-supported dentures are also better for your overall oral health. With traditional dentures, there is always a risk of lesions on the gums and other soft tissues that come into contact with the plates. Since mouth irritation is a known cause of oral cancers, there is reason to believe that choosing dental implants over traditional dentures can reduce your risk of developing oral cancers. We generally recommend implant dentures whenever possible, but there are a few caveats you should be aware of. First, dental implants cost more upfront than traditional dentures. Since they do require surgical insertion and more visits to the office, the process is simply more expensive. However, it’s important to remember that when properly placed, dental implants require very little maintenance and frequently last a lifetime. Traditional dentures, however, need to be relined regularly and can contribute to painful oral conditions that require medical attention. When you compare the number of dental visits, upkeep expenses, and the cost of denture adhesives—over time, dentures may cost just as much as implants. Dental implants also require a significant time commitment. After insertion, they must integrate with the jawbone (osseointegration), which can take three months or more. Implant-supported dentures are not an instant solution, but most patients feel they are entirely worth the process. Their unique benefits over traditional dentures contribute to better quality of life–and that is worth the extra steps involved. If you or a family member has lost teeth and currently wears dentures, now is a great time to learn more about dental implants. Call Metropolitan Dental Care and we’ll schedule a free consultation so you can learn about the benefits, process, and common financing strategies our implant patients have used. Our team of dentists are dedicated advocates of improving your quality of life with implant dentistry, and we love to see success stories. Call us today at 303-534-2626 to make an appointment and we’ll help you determine whether implant-supported dentures are right for you. Schedule your consultation at our Denver, CO or Lone Tree, CO dental office today!